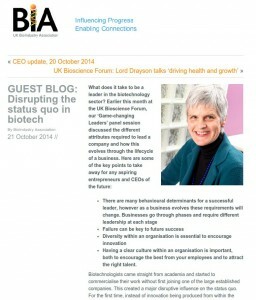 What does it take to be a leader in the biotechnology sector? At the UK Bioscience Forum, the ‘Game-changing Leaders’ panel session discussed the different attributes required to lead a company and how this evolves through the lifecycle of a business. Miranda Weston-Smith, founder of BioBeat, discusses disrupting the status quo in biotech and recognising the contribution of biotech’s leading women.